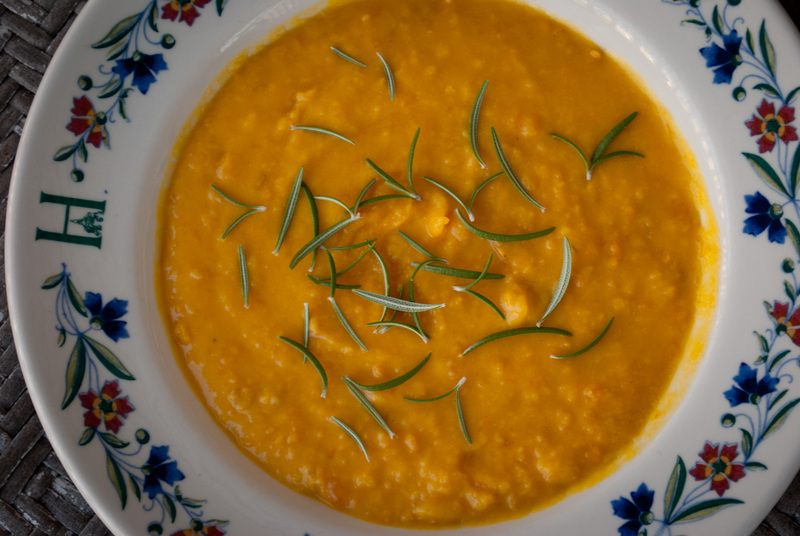 pumpkin, carrot, & parsnip soup | gluten-free glory! I made this soup from scratch about a week ago and had it for lunch every day this week. It’s perfect with some toasted (gluten-free) bread and goat cheese. No photos, unfortunately, but it’s not much to look at anyway; just really, really tasty! The recipe is an estimate because I was making it up as I went along, but it should be close. I also made it in stages; the roasted pumpkin happened first, then the tarragon turkey stock and soup came a few days later. The stock was inspired by this lovely post from a blog I recently discovered. put the turkey and vegetables in a stock pot (mine holds up to 12 c. of liquid, I think) and cover with water. bring to a boil and then immediately turn down the heat. if foam appears on the surface of the water, skim it off with a spoon. simmer for 1 hour, then remove all of the veggies (set aside the carrots and parsnip for later and discard the rest). remove the turkey long enough to pull all the meat off the bones, then return bones to stock and simmer for another 2-3 hours. add salt to taste. combine pumpkin, carrots, parsnip, and 2-3 c. turkey stock in a medium saucepan and bring to a boil. simmer for 20-30 minutes, or until veggies are soft enough to mix. using a hand mixer, puree veggies until smooth. add additional turkey stock to reach desired consistency, and cream, if desired (it’s good either way!). garnish with rosemary if you like, or eat as is! Pingback: gluten-free fettucine with bacon, brussels sprouts, cranberries, and caramelized onion « gluten-free glory! Yummers Love it ,Love it,Love it…..